← Nominate a Book App for the Cybils! I got the chance to participate in the New Media in Storytime training sponsored by the Maryland Eastern Shore Regional Library. Cen Campbell provided everyone with fantastic information and insight into using picture book apps and other newer technology in a storytime and library setting. After seeing how successful her demonstrations were, I was determined to try a picture book app in my own storytime to see how my families would respond. I decided that I would have enough material for a “normal” storytime (i.e., no apps) but have one ready to go if the group I had that day was up for it. I decided to actually show the story directly from my iPad screen to keep it simple. After we finished our story books, I had the children move closer to the front so that everyone could see. We used the “Don’t Let the Pigeon Drive this App” on the iPad. If you are not familiar with this particular app, it features Mo Willems’s Pigeon asking to do something that the user denies. If a child is familiar with the Pigeon in book form, he or she will have no problem adapting to the app. There are three options that allow users to have different levels of control over the storytelling elements. The first level, “egg,” simply tells a story. Level two, “chick,” allows the user to pick different elements of the story from different lists. Finally, the third level, “Big Pigeon” allows the user to record his or her voice to add a personal creative element to the story. I used this app in two different storytimes, one with 18 children and one with 12. I decided to use the chick version so that we could add some creative ownership to the story by picking elements, but we wouldn’t have to try recording sound with that many young children trying to help. Some of the children had trouble NOT touching the iPad. I could tell that they weren’t used to having a table present and not being able to touch it. However, once I explained that I would be pushing the buttons so that everyone could see, they understood and managed to keep their fingers in check. As each option for the story was presented (what is the smelliest – gym socks, kitty litter, or stinky fish), the children called out choices and I tapped the picture to add it to the story. Once all of the choices had been made, we were ready to hear the story we helped create. The kids were entranced. They listened intently and participated by yelling “No!” when the Pigeon made his request. After the storytime, I had a chance to talk to a parent to see what she thought about integrating apps and technology into storytime. She said that she liked it and that as long as it wasn’t the only thing we did in storytime, she thought it was a nice addition. 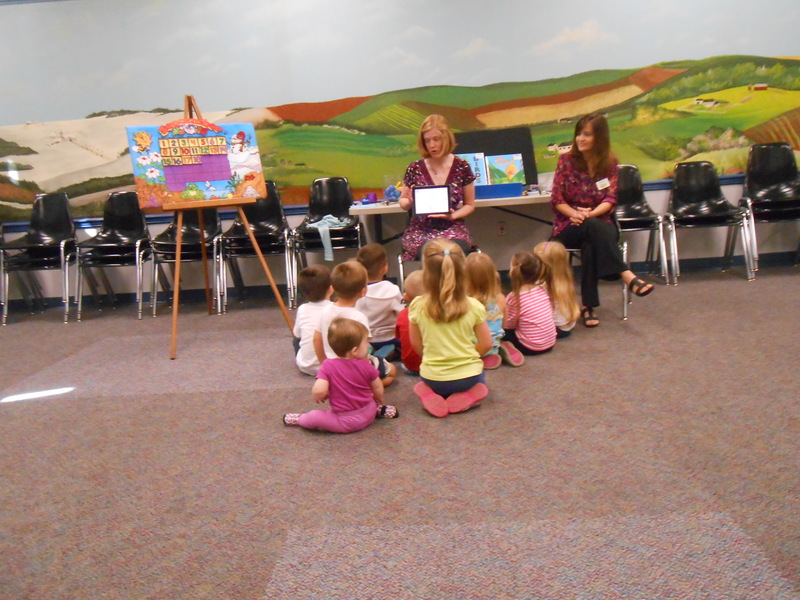 Overall, I thought my first app in storytime experience was a success and I hope to try more in the future! Catherine DiCristofaro is the youth services librarian at the Charlotte Hall Branch in the St. Mary’s County Library System. Catherine served on the 2012 Blue Crab committee for the Children’s Services Division of the Maryland Library Association. She is passionate about picture books and making sure that children and adults alike view reading as something that is fun and worth doing! Posted on October 7, 2013, in Apps, Field Notes, Interactivity, iPad and tagged Catherine DiCristofaro, October Challenge. Bookmark the permalink. 4 Comments. I have been using Apps in my storytime for about a year with my 31/2, 4, and 5 classes. We start with music and movement, read a regular book, do parachute games, read one book App together and then more music and movement. I make sure that each child gets to interact with the App, basically they all get touch things on one page by taking turns. They love it. Scruffy Kitty, The Very Itchy Bear and The Chicken and the Egg have been big hits with them. Hi Shelley! We’d love to feature you and your storytimes on LittleeLit.com! Would you be willing to do a guest blog post for us? Yes – I would love it. So happy to hear about the success of using the App in your storytime! I hope you will consider our new interactive App, ‘A to Sea’ for a future reading.